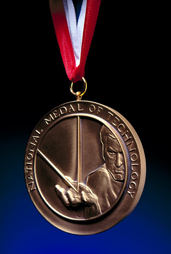 President George W. Bush presented the National Medal of Technology to Chrissie England, president of Industrial Light & Magic, and George Lucas, on Monday, Feb. 13, 2006 at the White House. The ceremony marked the first time an entertainment company has received the nation’s highest honor for technical innovation. Bush recognized Industrial Light & Magic for the visual effects company’s 30 years of innovation in the motion-picture industry.